A landslide vote in favour of overturning Ireland's abortion ban gives "hope" to Northern Ireland, UK minister Penny Mordaunt has said. The referendum result has sparked calls for the issue to be reassessed in Northern Ireland, where laws are much stricter than the rest of the UK. But Democratic Unionist MP Ian Paisley said it "should not be bullied into accepting abortion on demand". Voters in the Irish referendum backed a law change by 66.4% to 33.6%. Following that result, Northern Ireland will soon become the only part of Britain and Ireland where terminations are all but outlawed. Those taking part in Ireland's referendum were asked whether they wanted to repeal or retain a part of the constitution known as the Eighth Amendment, which says an unborn child has the same right to life as a pregnant woman. The vote in favour of repeal paves the way for the Dáil (Irish Parliament) to legislate for change which would see the introduction of a much more liberal regime. Labour leader Jeremy Corbyn said the referendum result was "a fantastic victory for women's rights". After early results suggested a landslide, women and equalities minister Ms Mordaunt tweeted that it was a "historic" day for Ireland and a "hopeful" day for Northern Ireland, adding "that hope must be met". Liberal Democrat leader Sir Vince Cable said the UK government should take advantage of the current lack of a devolved administration in Northern Ireland. He said: "Since there is, effectively, direct rule from Westminster, the government has responsibility and it can and should take the opportunity to deal with this issue properly. "The position in Northern Ireland is now highly anomalous and I think, probably, action will now have to be taken." 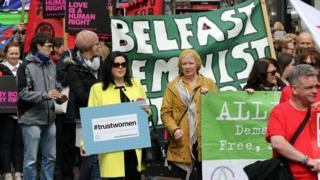 The United Nations said in a report published in February that the UK frequently violated women's rights in Northern Ireland by restricting access to abortion. And Amnesty International, which campaigned for the yes vote in the Republic, said nearly "three-quarters of people" in Northern Ireland wanted to see a change in abortion laws. Colm O'Gorman, of Amnesty International Ireland, told Radio 4's Today programme: "It's entirely unacceptable that women and girls there still have to travel over to Britain to access abortion care." The British Pregnancy Advisory Service, a charity which provides abortions, said the UK government "cannot continue to try and absolve itself of their responsibility to these women". Clare Murphy, a director of the charity, said: "While the government can say that abortion is a devolved issue, human rights are not, and the collapse of the NI Assembly means that the power to right this wrong lies solely in Westminster."